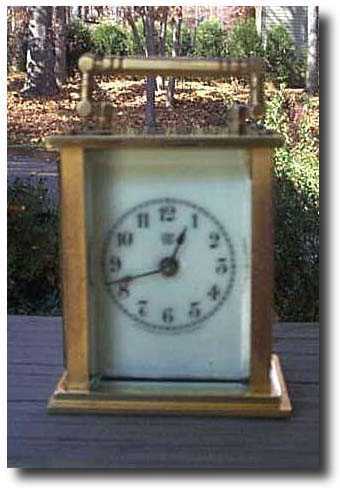 Waterbury Miniature Carriage Clock "SPECK" model, c. 1912 It is listed in Tran Duy Ly as no. 200, dating to 1912. This clock is in excellent condition for its age. The gold-plating has some tarnish spots but is over all intact. All beveled glass panels are present. There is one small chip on the top right corner, otherwise the glass is in great condition. The porcelain face is without cracks and has the Waterbury logo. The movement is a one-day and is keeping good time. The movement is marked 'patented May 6, '90, Dec 23 '90, April 27 '97, Waterbury USA'. It has recently been cleaned and serviced. The clock stands just 3 inches high.